Who’s to keep police accountable for their actions aside from the police themselves? 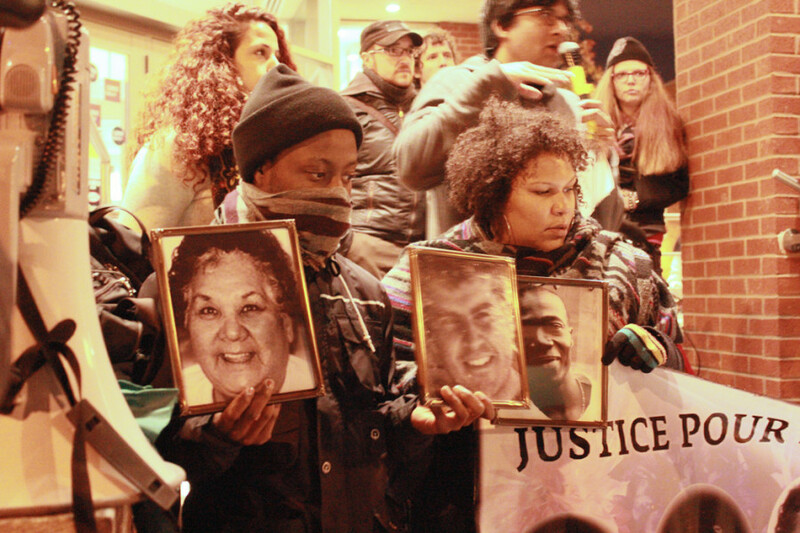 Advocates denounced the lack of transparency the families of victims of police killings receive by law enforcement officials on Friday evening. The fifth Annual Commemorative Gathering and Vigil for Victims of Police Killings hosted nearly 150 people this Wednesday. Protestors gathered in front of the police station on Gilford Street in solidarity with families who have been affected by police violence. 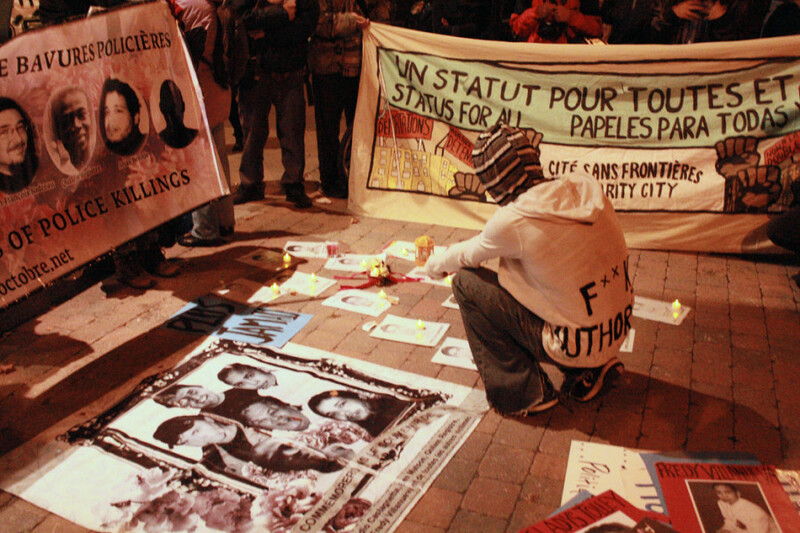 The vigils started in 2010, after the families of several police brutality victims came together at the Forum Against Police Brutality and Impunity to show support for each other’s struggles and to remember those they’ve lost. Robyn Maynard, a member of the Justice for Victims of Police Killings Coalition, commented on the likelihood of the creation of a third-party investigation bureau to investigate police misconduct. The number of police-related deaths in Montreal continues to climb. This year, 41-year-old Alain Magloire was shot multiple times in the thorax in front of the Berri St. intercity bus terminal as he allegedly threatened police officers with a hammer. Julie Matson says her father was attacked and smothered to death by a group of police officers in May 2002 over a parking dispute. Throughout the vigil insults were thrown at the police officers standing behind the glass doors of their headquarters. “I have some news for you. You stole something. You stole my brother, you stole him from his son, you stole the brother of my sister,” Jean-Sebastien Nadeau, whose brother died after police shot him in his Hochelaga apartment, told police. Another incident discussed at the vigil was the death of Mohamed Anas Bennis, who was killed on his way home from morning prayer at a mosque in Côte-des-Neiges in December 2005. Bennis allegedly attacked a police officer with a kitchen knife, which prompted the use of deadly force. Among the case’s inconsistencies pointed out at the vigil were the refusal by police to produce an attack weapon, the refusal by police to demonstrate the supposed wounds that the officer had sustained, and the withholding of security video footage of the incident. Additionally, the identity of the police officer in question was never disclosed. The circumstances of Bennis’s case are not unlike others in Canada. In the cases of both Fredy Villanueva and Claudio Castagnetta—both of whom were honoured at the vigil—the officers responsible for their deaths were exonerated. Some believe that the lack of reprimands toward the officers responsible resulted from the investigations being conducted by other police officers. This concern prompted a reaction from both the Liberal government in 2011 and the Parti Québécois government in 2012, who both introduced bills in the Quebec National Assembly that would have created an independent “civilian oversight bureau” called the Bureau civil de surveillance des enquête indépendantes. However, neither amendment was implemented.